Pur~lisse is an Asian meets French skincare brand. Both of which are hot topics in the beauty community at the moment so I was super excited to try this cleanser. And this lives up to my every expectation! It's described as milk but its thicker than a milk and has a kind of sticky consistency, but it's easy to apply and move around the face. Once it's mixed with water it turns to a more milky consistency. I've been loving this as my second cleanser. It leaves my skin so smooth and hydrated. It contains Blue Lotus extract which is a great anti-oxidant to fight free radicals that can leave the skin looking dull. While I don't think this has only helped brighten my skin, this is a great cleanser and really does leave my skin so smooth. It's also light enough to use in the morning. This has taken the top spot of my favourite cleanser! 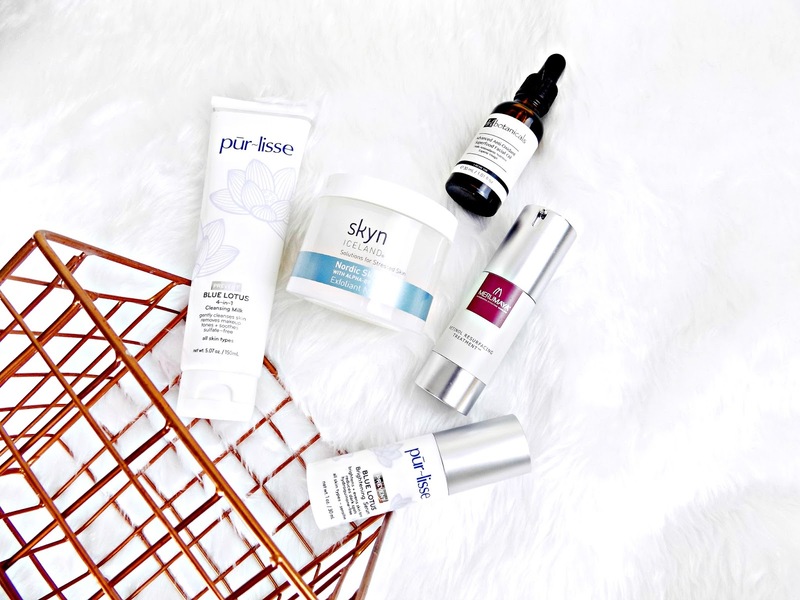 I couldn't do a post about brightening skincare products without including at lease one AHA based product. And the one that made the cut for this post are these Skin Peel Pads. The pads are highly saturated in Lactic Acid and Fruit Enzymes that help dissolve the glue that holds dead skin cells together. One sweep of these and my skin is instantly smoother and brighter. They also give my skin a glow! These are perfect for anyone looking for a quick, easy brightening hit! Now this is pricy stuff and for good reason. The results are fantastic. I started to see results after maybe 2 uses, which is really incredible. This is a light, fast absorbing serum. It contains the trusty Blue Lotus Extract, Lupine Peptides which help brighten and promote luminosity, Vitamin C and Alpha Arbutin which are also great brightening ingrediants. My skin looks a lot brighter and clearer since I've been using this. Another great brightening product is this offering from Merumya. This contains Retinol which is one of the only clinically proven ingrediants that help reduce fine lines and wrinkles. Retinol helps gently exfoliate the skin and encourage the skin cells to renew, which in turn helps skin to look brighter. I like to use this once or twice a week at night and in the morning my skin feels incredibly soft, looks brighter, more refined and has a healthy glow. I've raved about this oil so many times on my blog and it has quickly become a skincare staple. This oil is jammed packed with ingredients that help heal, sooth, rejuvenate and hydrated the skin. This isn't aimed at those with dull skin but the extra shot of hydration this gives my skin leaves it so soft and glowing! I like to use this at night, (it's fast absorbing though) and in the morning it leaves my dehydrated skin so soft and more glowing! I really can't recommend this enough. Those are the products I reach for when my skin is looking dull and lack luster.